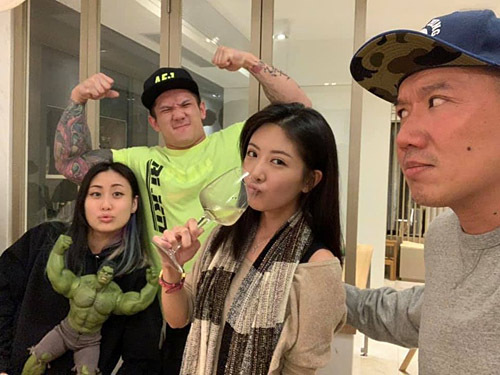 Chapman To (杜汶澤) and Kristal Tin (田蕊妮) have been married for 14 years, and though he had cheated in their marriage in the past, the couple worked out problems in their relationship and remain happily married. It came as a shock when recently Kristal was in Japan for work, and Chapman was spotted driving a woman back to his house. Reporters caught them stopping by a convenient store to smoke and talk before returning to his home. When they reached their Chapman’s home entrance, reporters immediately took pictures, which scared the woman into ducking to avoid the flash photography. Chapman immediately told her to get back up to avoid any misunderstandings. When questioned about this mysterious woman the next day, Chapman responded that she was a makeup artist from Malaysia who was working with him on his new filming project. In fact, Chapman even posted a photo on his social media to clarify the situation that he was hosting a gathering with his work friends and that they were only having a casual dinner. There were two cars driving back to Chapman’s house, and the woman happened to ride in his car. He even specified that his wife, Kristal, is aware of this gathering. This article is written by Hailey for JayneStars.com. Chapman To is too well seasoned on this area to be caught like that. After all, he did many movies about going out to cheat. My fav is always Men Suddenly in Black. Just watched Men Suddenly in Black last week with my wife. Not my type of genre but it was decent and during a time of Infernal Affairs rip offs….